Ok, time for my "will it fit" question: 2x140mm fans on the bottom, plus 1x120mm fan on the bottom front, with SFX-L PSU? I'm planning an all air cooled build with as much fresh air on a single GPU as possible, but I also want a front intake to handle the times when the case will be on carpet. The Noctua C14S *exactly* meets the clearance specs with the side bracket in place. This looks ideal to me if the fan can be anchored to the bracket instead of the heatsink, both for less stress during travel and for holding filter material in place. I don't have anything else to add since this case is perfect for my needs as is. 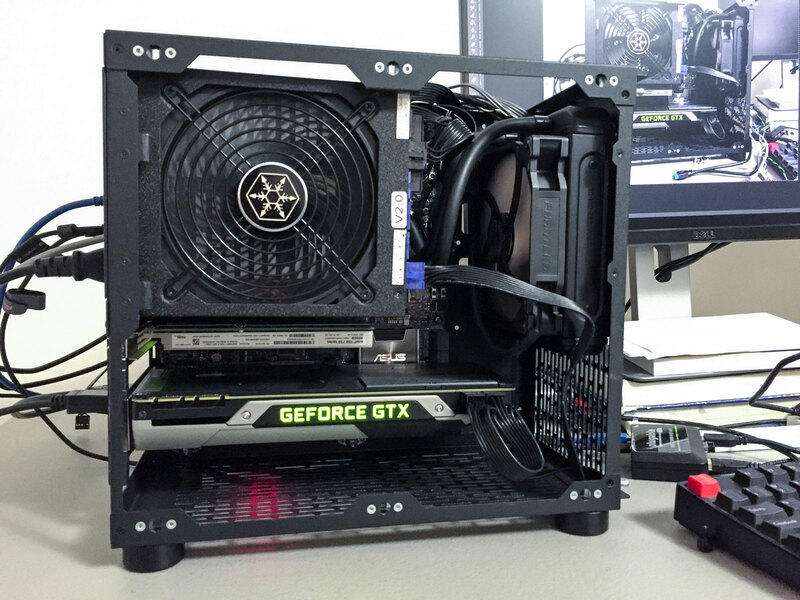 I don't see any problem that a Corsair H100i GTX would not fit in this case. My wallet is ready for the crowd-funding. A well-designed product should deserve huge support. I bought, IMO, the best camera messenger bag last year and that one was funded to $5 millions (most successful bag on Kickstarter). So I wish you guys the best of luck with the campaign. I had tested 3.5" drives, I didn't notice anything out of the ordinary. I haven't tested 2.5" mechanical drives but there is no dampening on the 2.5" brackets because there wasn't space for it. The steel is decently thick so I've never had problems with vibrations for the case in general. Airflow and fan noise is basically comparable to Nova. I don't have the equipment to test it scientifically but I have not had any problems. For the rear plates, the production design is certainly not ideal for those who want to easily switch between setups, but that's also a niche use case. Most people will get one or the other and leave it (I could be wrong though and we'll ask in the poll to check). The issue I had with the plate is it had no benefit to SFX/SFX-L users other than weakening the frame and upping the part count (which increases the price). From previous polls the majority were interested in SFX/SFX-L hence the decision to drop the plate. 240mm + 120mm is doable. 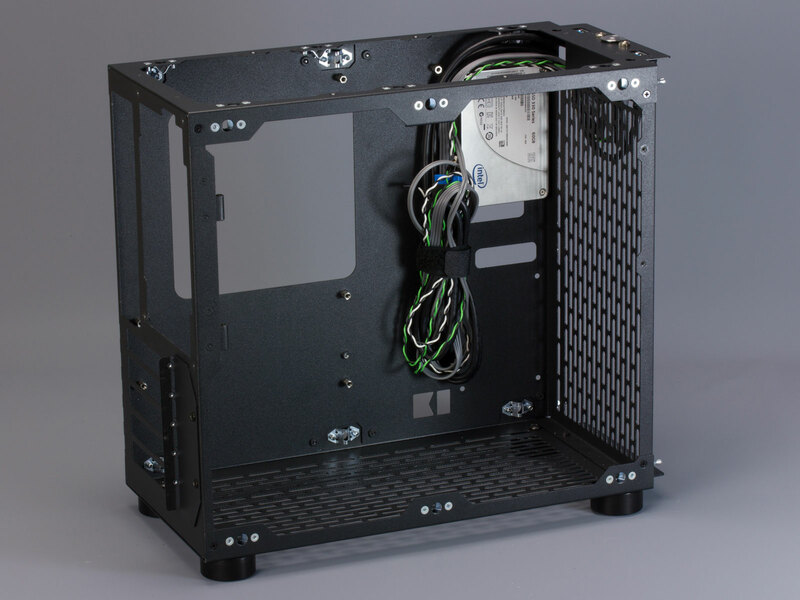 With an SFX/SFX-L unit you'll have the 240mm on bottom and 120mm on the side. With an ATX PSU it'll be 240mm on the bottom and 120mm on the front. Or you could do 240mm on the front and 120mm on the bottom if the cards aren't too long. You may not be able to use all the screws on the 140mm because the feet will be in the way of some of them. For the 120mm, it'll fit there depending on the PSU. 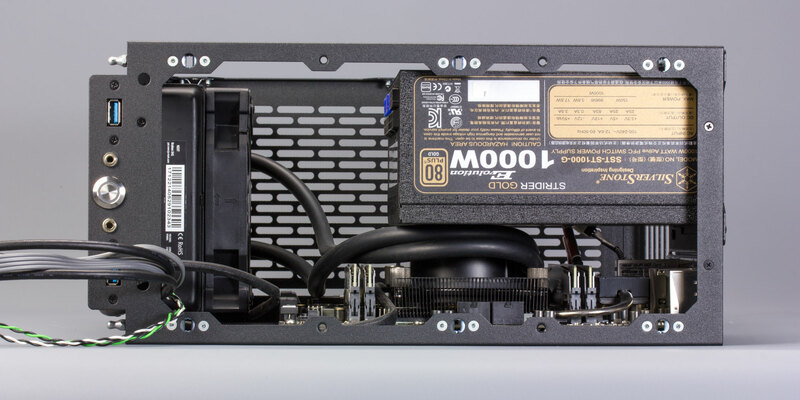 It works with the SX500-LG because the connectors are offset such that the fan just fits between them and the frame but that may not be the case on future models. Luckily all the SFX-L units currently out are based on the same Sirfa platform so they should all work too. Yes, with a top-down heatsink it's better to attach it to the bracket if possible because that's less weight on the cooler if you transport the system. Thanks! Crowdfunding gets its fair share of criticism for scams and stuff but there's lots of great projects out there. Last year I had gotten the Grip6 belt and I love it, best belt I've ever owned. Really great work you guys have done on this. Very impressed. Here's hoping for a successful crowdfunding campaign, and many more successes going into the future. No, the first prototype had a bit of space but I didn't find it that useful in practice and adding enough space to really make it useful would make the case larger than I'd like. finally its here, great work guys. Does that mean the 3.5" brackets have native dampening? And speaking of 2.5" drives, do those behind-MB mounts still go drive first with an ITX board? I feel kind of bad for Fractal Design. I'm about to migrate out of a Define R4, the Node 804 my main rig was going to and the Node 304 for my future server have both been replaced by Cerberus. well guess that makes up my mind on the window haha thanks for the reply. SO excited! Interesting! I had no idea the thickness of the radiator had such a drastic affect on cooling performance. That sounds like a good plan then. Yes, little rubber grommets. Nothing fancy. Do you mean the motherboard tray mounts? Yes, the CPU block really needs to have swivel barbs on the sides of the block for it to fit with an ATX PSU. Even then it's tight. 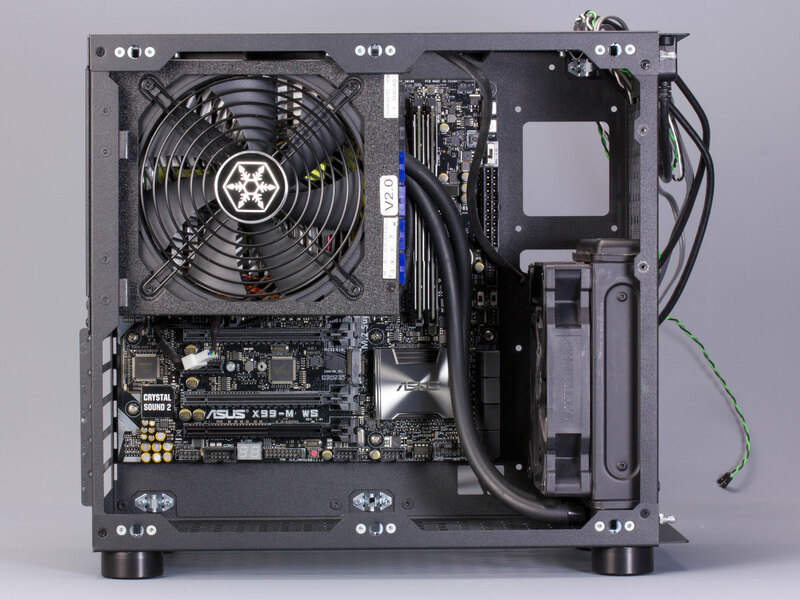 I guess you could get the ATX frame and use the new SilverStone PP08 adapter to use to mount an SFX PSU there instead to get the necessary clearance. Realistically, best case scenario, when would this case be at my front door? EDIT: I live in America. Thanks for the info. Unfortunately that is quite a bit further out than I can wait. Does anyone know of a case that is readily available that is similar to this case? mATX support.